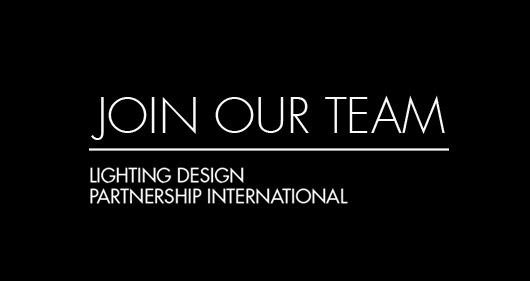 We have and have recently won, some very exciting projects and are looking for Designers of all experience levels for our Edinburgh Head Office. Should this be of interest, please email a CV and portfolio to edinburgh@ldpinternational.com with your story. 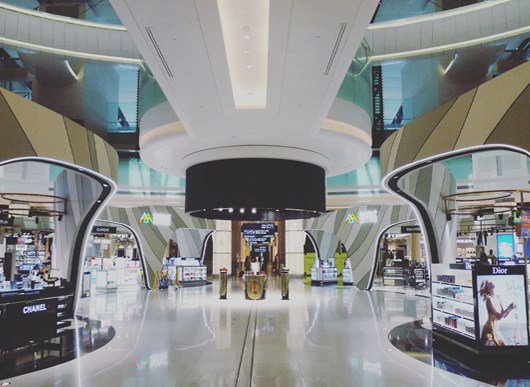 As one of our largest projects to date, we were excited to visit the new Muscat International Airport. Integrated lighting enhances architectural features whilst providing functional illumination to spaces which reach 30 meters in height. We utilised lighting to assist wayfinding in the new airport and the project has been well received by the Oman capital. 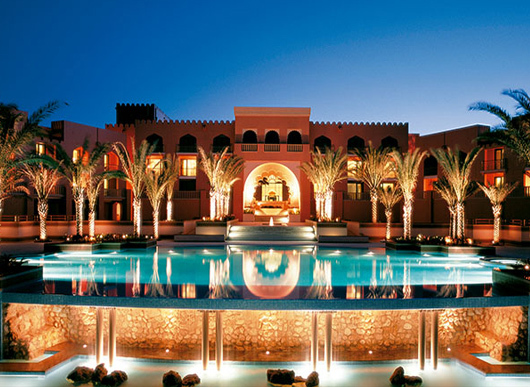 We don’t play favorites with projects… however The Barr Al Jissah is one of our signature hospitality projects to date and was the beginning of our long-standing history with Oman. We are delighted to see Elekta’s Cornerstone development nearing completion. 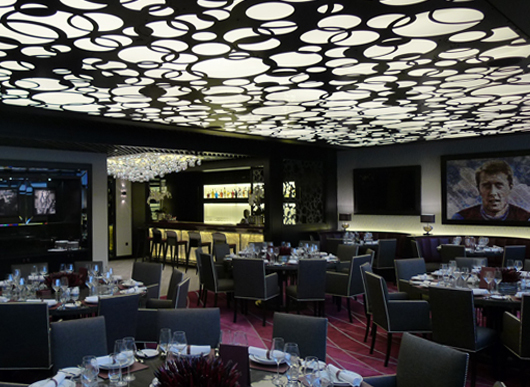 We worked with the Client, Developer and Design Team to ensure our lighting design intent for was attained within budget. 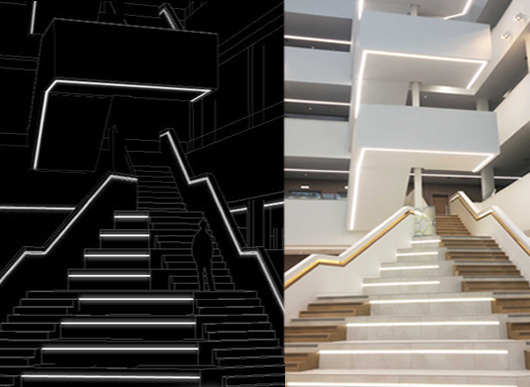 Pictured is our initial concept sketch and a progress photograph from site. 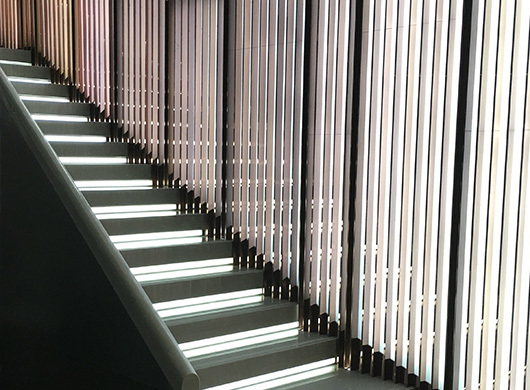 The geometry of the atrium feature staircase is enhanced by graphic lines of light. 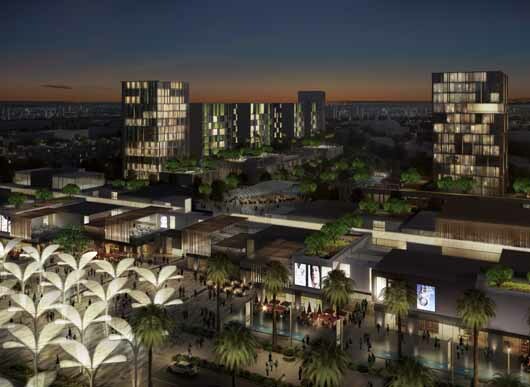 LDPi have been appointed to design site-wide external lighting for ‘The Pulse’ which will be the epicenter of Dubai South. The Atkins designed masterplan is a mixed-use development comprising residential, hospitality and retail. The site will feature many public amenities and incredible outdoor spaces which will encourage community engagement. Our design for Masterplan lighting will ensure the aesthetic and functionality of outdoor spaces is enhanced in the hours of artificial light. LDPi have recently completed lighting design for this car park facade and associated public realm with Architects: Cooper Cromar and Landscape Architects: MacGregor Smith. LDPi worked with Louis Poulsen to develop a palette of cor-ten street furniture luminaires which adds additional depth to the scheme. 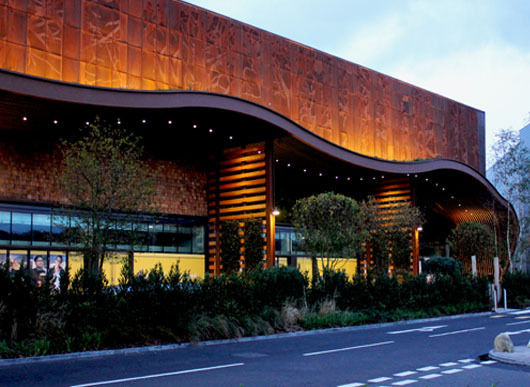 The dramatic facade has been well-received by visitors of the retail park. 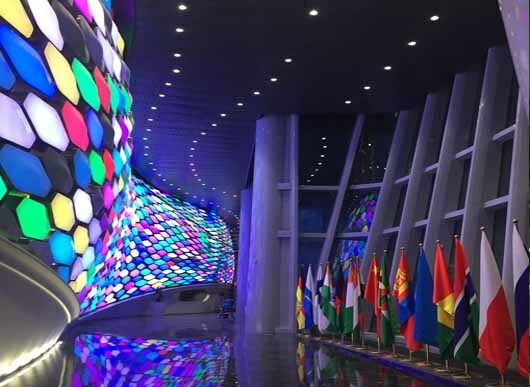 World Expo 2017 is now open and we are delighted to see our lighting design welcoming visitors to the site, in particular the Energy Hall which can be seen in the featured image. The Auditorium is contained by an interior facade comprising an active, colour-change membrane, spanning the entire 1,000 seat performance space. The interior facade acts as a theatrical experience throughout the day and night even when there are no performances. The auditorium interior is enhanced by integrated lighting techniques which highlights the contours of the AS+GG designed space. 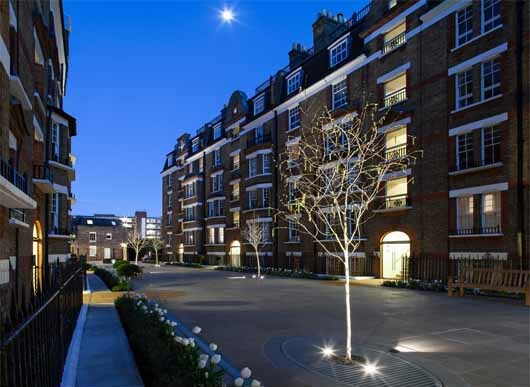 LDPi were commissioned by Chris Dyson Architects to design an external lighting scheme for Marlbourough Courtyard, Chelsea. Our design was subtle, utilising integrated accent lighting to create an atmospheric night-time environment for Residents. We are excited to announce our appointment on the Oman Museum project with COX Architecture. Commissioned by The Royal Court Affairs the Museum pays homage to Omani culture via an incredible architectural narrative. Set in Nizwa, LDPi are seeking inspiration from the geometric profile of the nearby Al Hajar mountains and the natural light and shadow within crevasses. The featured image is a render of our lighting techniques which will create a strong reflection of the COX designed copper facade into an adjacent reflecting pool. LDPi are delighted to see this residential project nearing completion. We have worked closely with our Client and Architects Chris Dyson to develop a lighting solution which was sympathetic to the former brewery turned residential in central London. With extensive external terrace space and a copper clad facade at high level this project is truly unique. The integration of lighting was designed to be anchored in the industrial aesthetics and intervention with surfaces was limited. On completion this will be a signature residential project within our LDPi lux* portfolio. Our high-end department store project within Deji Plaza is nearing completion. 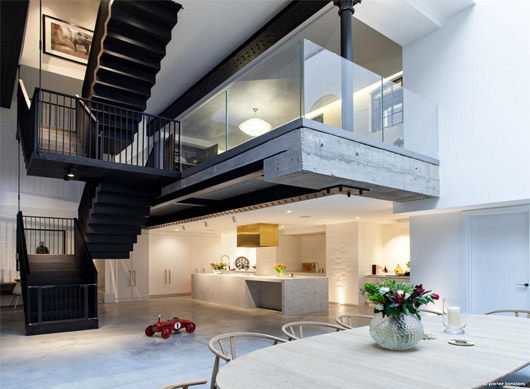 Pictured is the staircase which features integrated lighting details over three floors. LDPi worked with Four IV to design lighting which was in keeping with the corporate identity and branding, whilst allowing flexibility for concession display. 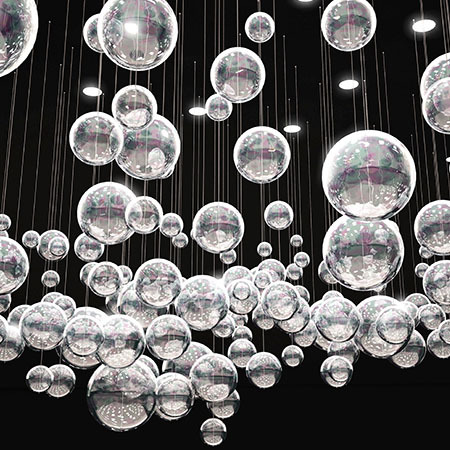 LDPi are working on the design of a dynamic chandelier for a very special London location. Over one hundred hand blown, iridescent globes are suspended at differing heights to create an organic canopy of illumination. 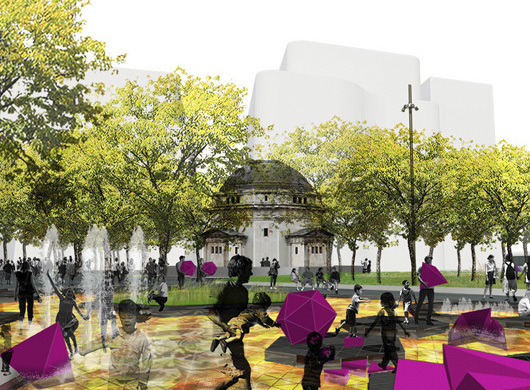 LDPi are assisting Barton Willmore in a RIBA competition to redesign Birmingham’s famous Centenary Square. 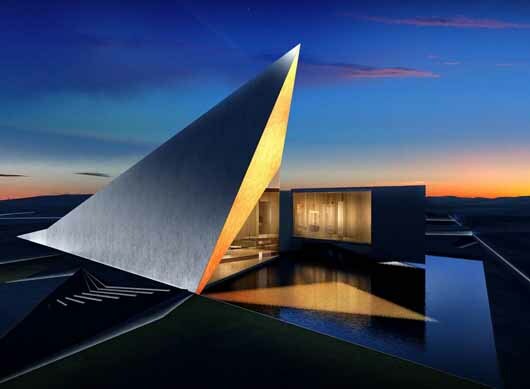 Proposals include lighting projection to landscape. Barton Willmore have been shortlisted to the final 5 of 185 international applicants, LDPi wish them the best of luck in the final stage of competition. 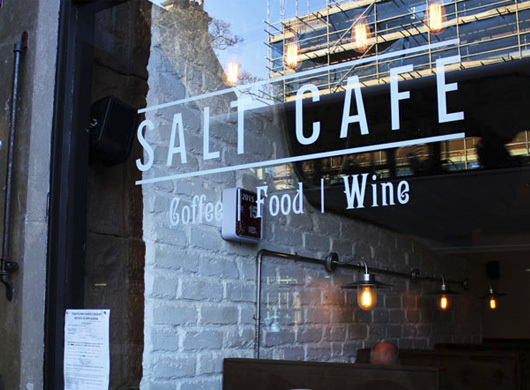 Friends of LDPi recently opened SALT Cafe and have created a unique interior using only reclaimed materials. LDPi assisted with an integrated industrial lighting aesthtetic to create a stunning night-time environment for this popular bar/eatery. LDPi are currently developing concepts for an office development. 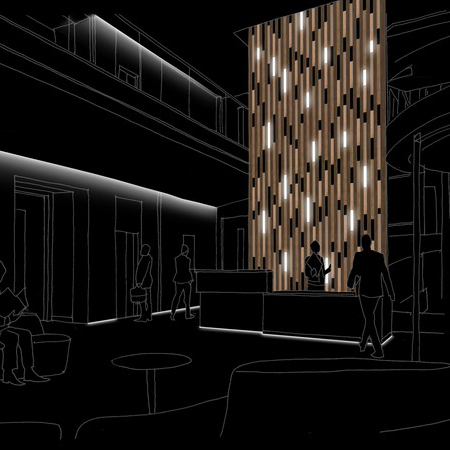 Integrated graphic lines of light contribute to the timber slatted feature wall. 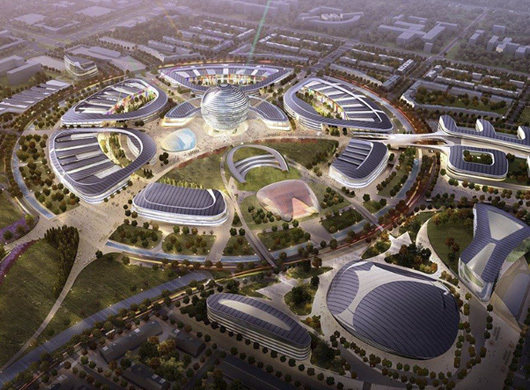 LDPi are appointed as Lighting Designers for World Expo Astana 2017 with Masterplanners Adrian Smith + Gordon Gill. 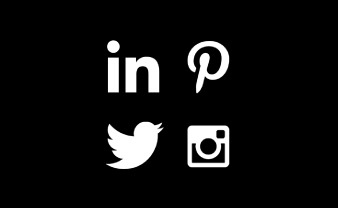 We are looking forward to developing concepts for this exciting project. 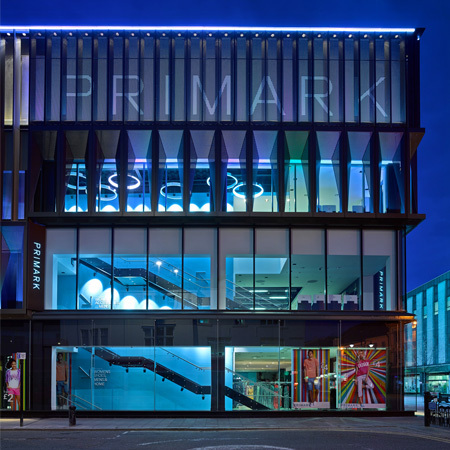 LDPi are pleased to announce the completion of Primark Store, Newcastle. The external lighting scheme was designed in conjunction with 3D Reid, Edinburgh based architects, to highlight and complement the architecture and branding of the store. The external scheme has been completed entirely with LED light sources.